How many times have I seen the musical version of Monty Python’s Spamalot? A lot, a lot, a lot (sing along with me). And how many times does it make me laugh? Every time. Without fail. It’s a really entertaining couple of hours at the theater. What’s not to love? There are rude French people, Sir Lancelot, questions about sparrows, flying cows, a killer rabbit and lots of the silly humor we all can quote by heart from the film “Monty Python and the Holy Grail” featuring member Eric Idle, who wrote the book and lyrics for the show and co-wrote the music with John Du Prez. 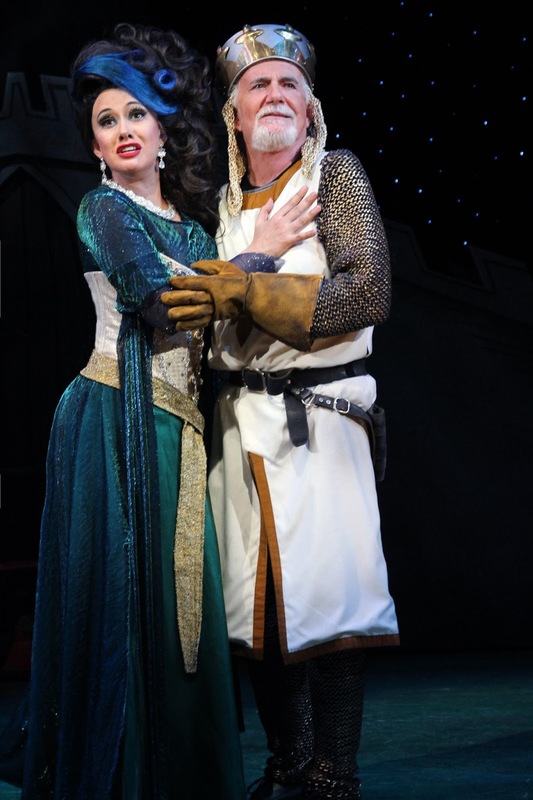 What makes the production currently running at CT Repertory Theatre especially sweet is the terrific pairing of comedian Richard Kline (TV’s “Three’s Company”) and the marvelously voiced Mariand Torres as King Arthur and the Lady of the Lake. Camelot has never had such a charming first couple. In short, Spamalot is a quest for the Holy Grail by Arthur and the Knights of his roundtable: Sir Bedevere (Kent Coleman), Sir Dennis Galahad (Chester Martin) Sir Lancelot (Bryce Wood), Sir Robin (Nick Nudler). Along the way, they meet up with some interesting characters, including the Black Knight (Curtis Longfellow) who doesn’t fare so well in battle, the Knight of Ni (Susannah Resnikoff) who requires a shrubbery, Prince Rupert (Ryan Rudewicz) who waits in his pink-décor tower for a prince to rescue him and the Lady of the Lake who guides the king. Arthur also is helped along the way by his faithful and totally unappreciated servant, Patsy (an excellent Gavin McNicoll) who carries his master’s load and doubles as his steed by providing horse-hoof beat sounds by clicking coconut shells together. Either you are chuckling because you are a fan, or you are wondering what in the world I just was talking about. There certainly are plenty of familiar gags here to elicit chuckles, but there’s also more, which is why the show earned a Tony Award for Best Musical in 2005. I personally laugh every time I hear “The Song That Goes Like This,” a dramatic duet by the Lady of the Lake and Sir Gallahad about how in a normal musical, they would be singing a soaring ballad at this point in the action. Mariand Torres and Richard Kline. Ha ha ha ha ha. That is me laughing just typing those lyrics. The Lady of the Lake also has another song called “Whatever Happened to My Part?” Very funny stuff directed by Richard Ruiz (who performed with Kline in The Sunshine Boys at CT Rep) and choreographed by Tom Kosis, The 11-person orchestra sounds great and is conducted by John Pike. The diamond in the crown of this Camelot is Torres, however, who recently returned from Japan and the world premiere of Prince of Broadway. She is a star to watch. Catch her in Storrs while you can. 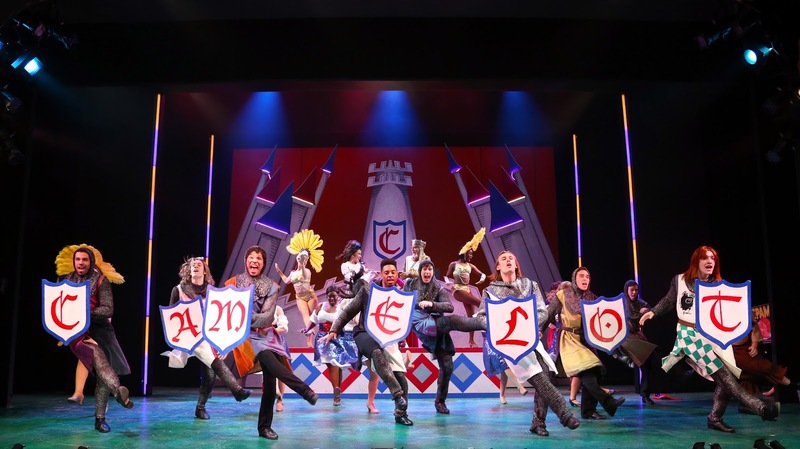 Spamalot quests for the grail at the Harriet S. Jorgenson Theatre on the Storrs campus of UConn through May 1. Performances are Wednesdays and Thursdays at 7:30; Fridays and Saturdays at 8 pm. Select matinees Saturdays and Sundays at 2 pm. Tickets $7 to $30: www.crt.uconn.edu; (860) 486-2113. Production: Music by John Du Prez and Eric Idle; book and lyrics by Eric Idle; Direction by Richard Ruiz; Assistant Direction by Nathan Francis, Music Direction by John Pike, Choreography by Tom Kosis, Assistant Choreography by Olivia Benson, Scenic Design by Abigail Copeland, Assistant Scenic Design by Brett Calvo, Technical Direction by Gregory Maine, Lighting Design by Adam Lobelson, Assistant Lighting Design by Danielle Verkennes, Costume Design by Heather Lesieur, Assistant Costume Design by Sheri Giglio and Elly Nuy, Sound Design by Justin Graziana and Joel Abbott, Projection Design by Josh Winiarski, Puppet Design by Shane McNeal, Flying Direction by Ed Weingart. Voice and Accent Coaching by David Alan Stern.